Hi, everyone! Happy Tuesday! I am so excited for today’s post because this is honestly one of my favorite outfits, ever! It perfectly describes my style which is classic and neutral. Lately, I’ve been gravitating towards more neutral pieces because I find that I get so much more wear out of them and I don’t get sick of them as quickly. This sweater is from LOFT and is honestly so soft that I wish you could feel it through your screen! I’ve listed the item number down below. I can’t find it online but you can call your local store and give them that item number! It is seriously the best. 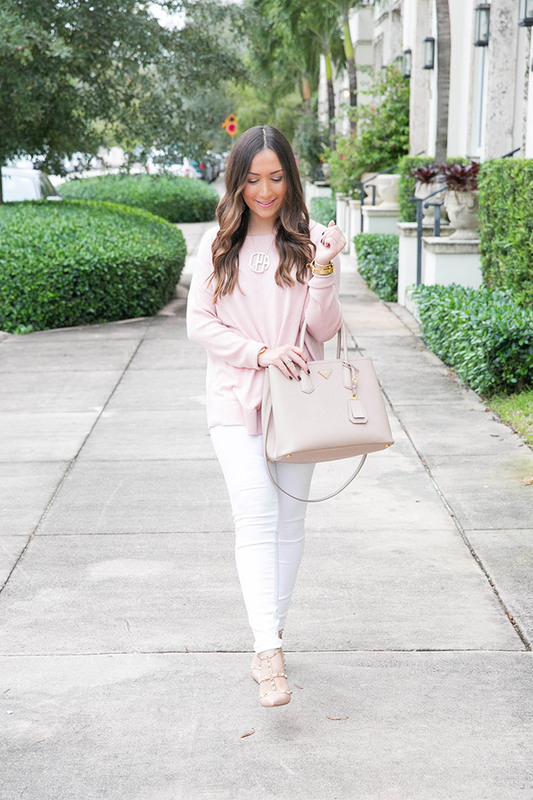 I hadn’t worn my large monogram necklace in a while so I decided to throw that on to add some edge to the outfit. I absolutely love this necklace! I wear it a lot and it spices up any outfit. I’m also wearing my charm bracelet for the first time! It’s so fun and you can add different charms to it to make it your own. Woohoo! Happy early birthday! I love that color! This outfit too cute! Love your outfit. 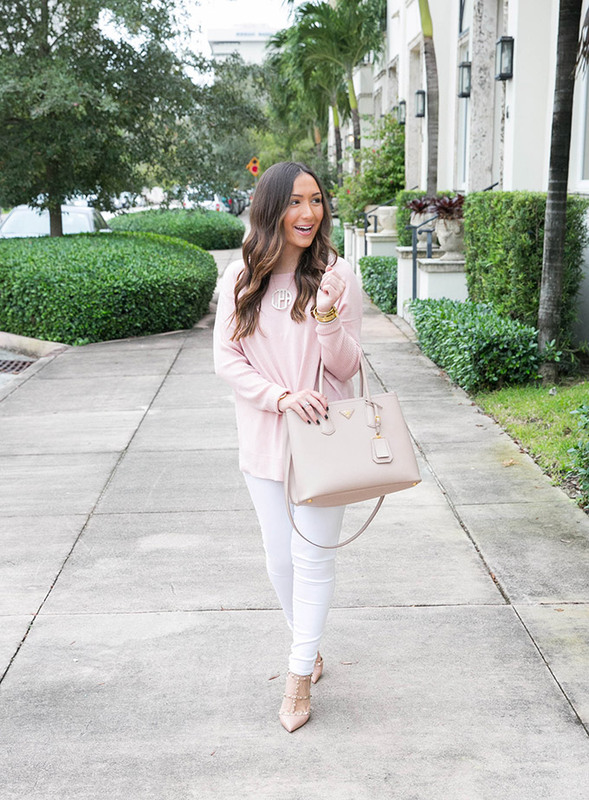 I’m having a love affair with light pinks this winter! Love the super cute outfit!! Pink really suits you. Seriously so obsessed with this outfit! You have fabulous taste! The large monogram necklace is such an adorable statement. 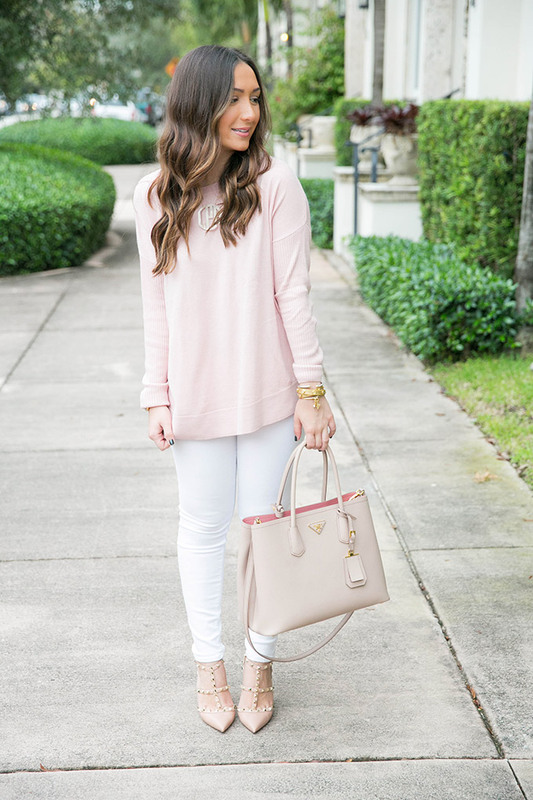 I absolutely love this blush outfit! I feel like it would be especially cute in the spring time. Happy early birthday- I hope that your day will be wonderful!! 🙂 And you continue to rock those neutral looks!! Gorgeous!! 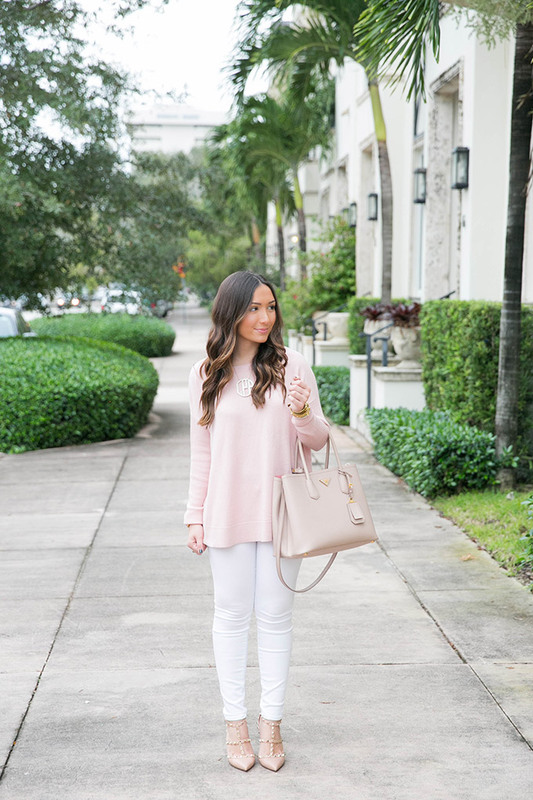 Nothing better than soft pink and bright white in winter! You rock this look. This outfit looks gorgeous on you! 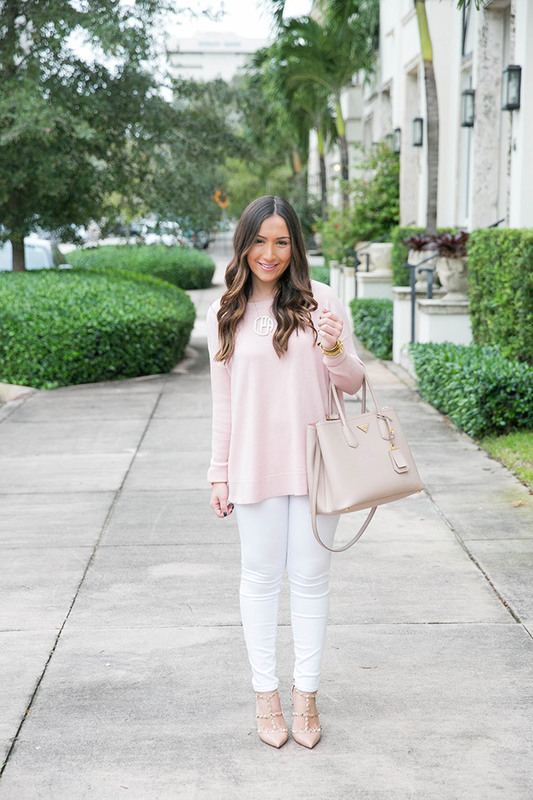 Light pink is so great for the winter. Aaah I just love this blush pink color on you. Totally beautiful! Beautiful as always! Rockin’ those Rock Studs too! Love this barely there blush shade! You are absolutely pretty in pink! I really am obsessed with blush. I want everything in blush! Gorgeous! I am and will forever be lusting over those shoes! Stunning, as usual! Love this outfit girlfriend!